It’s a trap!! Well, at least that’s what some observant Game of Thrones fans believe about a recent episode involving the Night King and a certain dragon. But, was the Night King planning on taking down Dany’s dragons the whole time? There just might be some evidence to support that case. In “Beyond the Wall,” things got difficult for Jon Snow (Kit Harington) and crew. As they made their way past the Wall to retrieve a Wight, they encountered some unexpected difficulties. Like a really epic undead polar bear and the Army of the Dead. Here’s Reddit user Sizzor19’s proof that the Night King had set a trap. 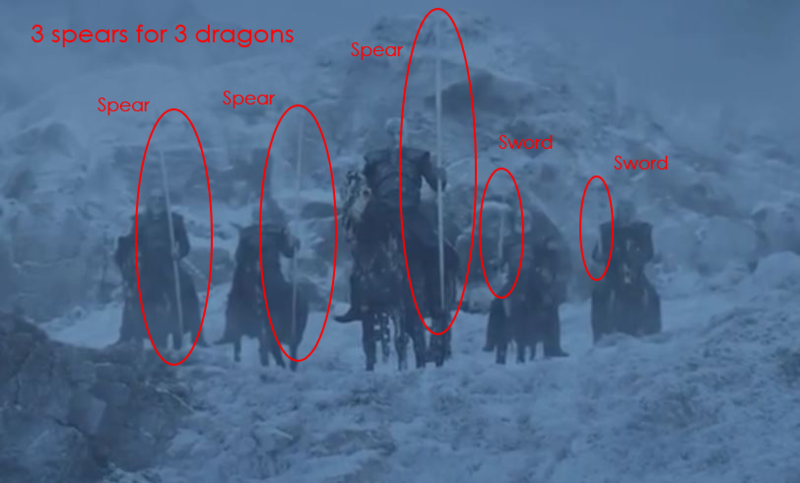 As noted in the photo, the Night King and his posse happened to have three spears ready for three dragons, while the other two dudes have swords. Obviously, spears are great weapons, but swords seem a lot more manageable — and, perhaps, make a better default. So, does this mean that the Night King knew exactly what would happen? It’s kinda hard to believe that he would not only know that Jon and the other men were headed past the wall, but also that they’d be able to send someone back *and* get the dragons to come save them upon running into trouble.